We made 3 spine rigs in class. This is the first one with 7 joints. Later we did it again to have even more joints, 11, that were evenly spaced. 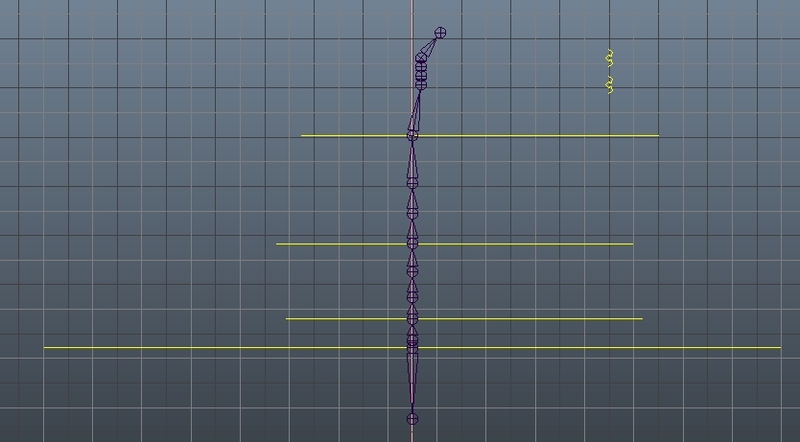 This is because more joints make a more even curve on bending with less creasing, 11 joints is easy to divide up for the blended spine, (you need an even number between the controls, 4 between each in the case of 11 joints) and evenly spaced joints because the IK rig needs this to work better. All 3 spines must have exactly the same number of joints in exactly the same space with the same orientations so that it all matches….. Build the spine straight not like a human S-shaped spine. The human skeleton works differently and we don’t want it to be as complicated, we want to emulate not copy. When we have joints in a straight line they are less likely to shift when IKs are added. what do we need to rig it. 5 – 15 joints is good for a spine. Here we have 7. Starting at the bottom we are using the 3 wishbone shaped back controls 1, 2 & 3. Back control 3 is at chest jt. To aid learning we put smaller controls on the in between joints so we could clearly see how each joint was bending, they are shown in the pictures. Also we constrained the small controls to the big ones. 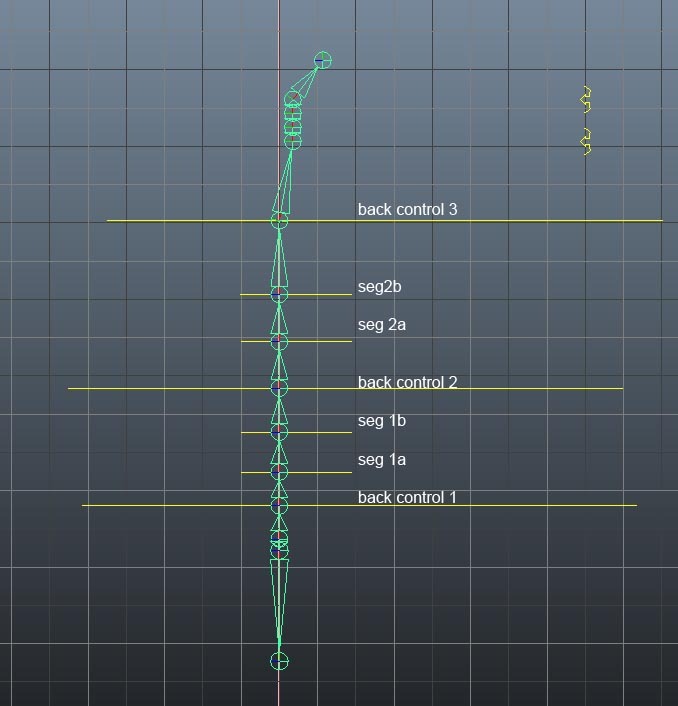 I have described constraining joints in this tutorial because in the later version we deleted the small controls and constrained the joints themselves. This uses less levels of constraints and thus is less likely to break. Freeze transformations on the controls and delete history. We want the controls to follow the joints so we point constrain them to the joints. Then we want the joints to follow the the orientation of the curves so orient constrain them to the curves. After that the joints should have the blue rotates in the attribute editor to show these are constrained and same with the control translates. The in between joints are given a weight which tells them how much to follow each control which is above and below them. 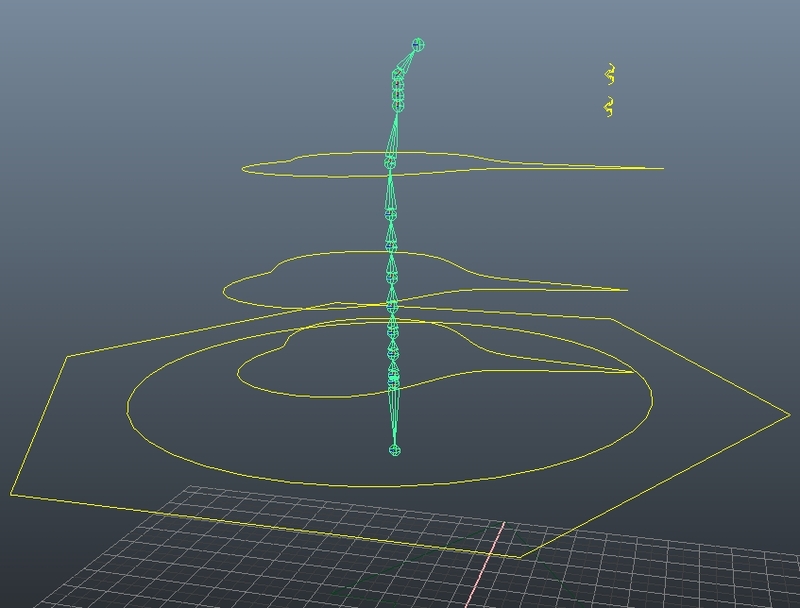 This works in the spine to make the whole spine bend together evenly. Point constrain back control 1 to spine joint 1. Do the same for every joint and control. Orient constrain the joint to the control with options set to maintain offset. G repeat up the spine. Select back control 1 and the joint above, at seg 1a, and orient constrain. 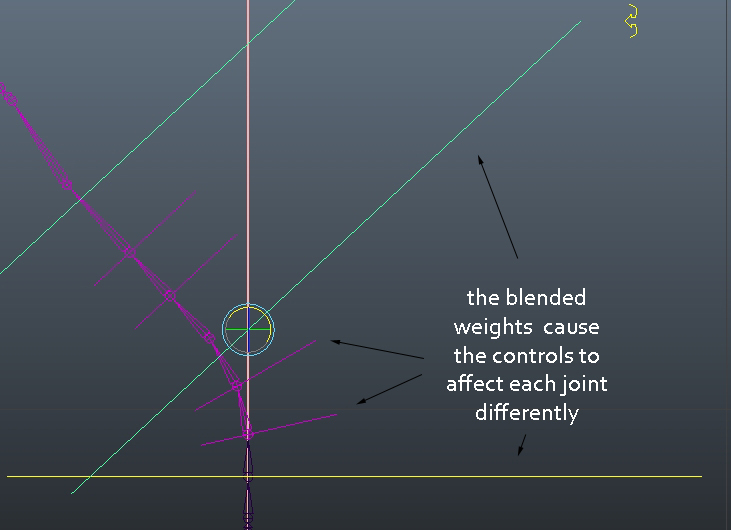 To set up the blend select back Control 2 and orient constrain the 2 joints below to it 1 by 1. Check in the channel box under shapes to see Back Control 1 W0 and to see Back Control 2 W1 the 2 back controls controlling this segment. put the back control 1 at 0.7, it now influences it 70% and the other at 0.3 or 30%. Now we have a weighted blend with the bottom back control influencing seg 1a 70% and the 1 above it 30%. Do the same for the seg 1b above with opposite numbers because it is closer to back control 2.